As I am a ‘do it yourself kinda gal’ I have gotten into the habit of making my own hummus from scratch – it is simple to do (ingredients, measure, blend, mix till smooth) plus the store bought varieties in my opinion are over priced and don’t taste nearly as good – no surprise there! Please read the comments for this recipe as there are some helpful hints! I have just learned from another blogger ‘Shooky’ that America chickpeas known as Garbanzo beans (Spanish word for chickpea) are better used in soups, and that the best humus is made using small dried chickpeas. 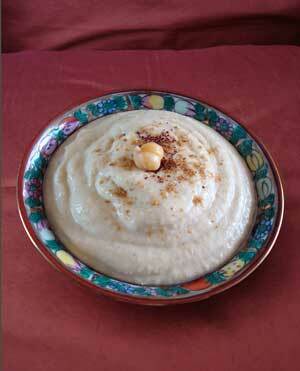 Hummus can be made in a variety of ways, to your own personal taste. If the texture of the hummus is not as smooth as you like it, add a little extra olive oil or water.